Our mission is to enliven Bandon through access to the best in contemporary art and artists: to inspire new ways of thinking, seeing, and doing. "Inspiration for my work comes from what I observe on my daily walks along the Oregon Coast. The color and textures in nature provide me with endless experiences that I want to recreate and express back in the studio. I enjoy that dynamism I observe so I tri to bring that power into my work. I love the experience of creating an abstract painting. Each application of paint triggers a new idea or approach that must be explored. It’s always exciting! Abstraction compels me further along a path of discovery. My approach to a painting mostly begins with an impression of color, movement and texture I have from the landscape around me. I use these impressions as a beginning to expand upon through intuition. Reacting to what has already been rendered allows for even more expressiveness. I enjoy the many layers that build up as I paint, always leaving a hint of what came before. I especially enjoy color as a means of communication, by the harmony or discord that can be created by its placemen. There is a paradox in a painting which appears simple, but has been extensively worked and layered to create a sense of superficiality. Deconstruction of an idea must occur in order to create something basic yet complex. Getting to the essence is hard, but for me, the breaking down of realism and coloring outside of the lines of existing parameters leads to an expression I want to explore as fully as possible. Painting moves me to remember an experience and when leads me to find something new to relate in that experience." Founded in 1983, the Second Street Gallery is conveniently located in the heart of old town Bandon, Oregon with easy access to State Highway 101 and walking distance to the harbor. Initially Second Street Gallery was a co-op, organized by a group of local artists who wanted a venue in which to sell their art. It was housed in the smaller, adjacent building west of the present structure. After a year, the gallery was purchased by the Harrisons in 1984 and moved to the Dahl building. The next move was across the street to the Continuum Building in 1988. In 1995 it was purchased by Debbie Johnson and Grover Hatcher and was relocated to its present site. In 2005 the gallery was purchased by Richard Rahmlow and Pat Nash and then purchased by Peter Bauer and Candace Kreitlow in late 2012. The gallery has been owned by Carrie McKim since March 17, 2018. Today the gallery represents the work from over 100 artists and companies primarily in the Pacific Northwest, working in a wide range of mediums. Seventy-five percent of these artists reside in the state of Oregon, while the rest call Washington, California or Canada their home. Please take the time to peruse the Second Street and be treated to a panoply of original art and gifts. Second Street Gallery welcomes new artwork submissions throughout the year, with our principal interest being artists from the West Coast of the United States. While the gallery would love to exhibit many artists as it learns of their work, it must nevertheless honor existing artist contracts. Constraints of space limit our ability to take on as many new artists as we would like. All items are sold on a consignment basis. If you are an artist who is interested in consigning, you may present your work in the following ways: Option A: By Appointment and in Person If you come in person, after you have made an appointment, you are welcome to bring a selection of your art with you. Please bring a brief biography and your suggested retail price for each work. Second Street Gallery will not spontaneously view portfolios or artwork during gallery hours. Thank you for considering Second Street Gallery for representation; we wish you success in finding a gallery that suites your needs. Option B: Email to secondstreetgallerybandon@gmail.com Attach 6 to 12 images in JPEG or PDF format of your artwork with your suggested retail pricing. Include your resume and, if you have a webpage, please include your URL. Attach an artist statement or brief cover letter. Please include "Artist Submission" in the subject line of your e-mail. I have developed a personal technique by which I weave traditional fibers with contemporary metalized polyesters. The visual qualities of reflective materials, Mylar and other plastics, are especially appropriate when I deal with the themes of water or light. My multi-harness loom techniques primarily involve an extremely dense warp of natural yarns that sandwich the reflective material. The amount of yardage in some pieces may include up to 7000 yards of yarn. I cut the Mylar, which I sometimes paint with permanent inks, into straight or shaped strips. When weaving, I choose whether to expose them enough to create a particular image or to cover them to create an almost hidden dimension or illusion. The pieces are finished when stretching them over a sculpted frame. The colorful textures and reflective plays of light create subtle to dramatic visual effects depending on the viewer's perspective and lighting conditions. There emerges an organic/inorganic dual quality from my weavings which merges the old with the new, the warm with the cool, providing a dynamic spark to interiors. Debra Street learned the painting process from her father. Danny, her father, wanted Debra to learn how to paint so she could carry the family art into the future... so she dedicated herself to learning everything she could about the process. Afterwards, she got so excited about it that she went home and decided to start her own business as well. She also was passionate about learning to paint so she could continue to stay home with her children and help support the family. Debra has customers all over the world that enjoy her scarves, ponchos, sconchos, shrugs, and ruanas. Every piece is hand-painted, therefore, unique in every way from another piece. I have been knitting as far back as I can remember. I must have been around seven years old when I started. In Sweden, my native country, all kinds of handcrafts are taught as part of our regular education. Through the years I have enjoyed sewing, crocheting, embroidery, weaving, lace making, and knitting. For the last 20 years, though, knitting has been my focus and my passion. I happily create sweaters, felted hats, scarves, mittens, caps, and more in the comfort of my living room. I only knit by hand; I use no machines. My garments are made using high quality yarn from all over the world. It is my sincere wish that my creations will spread the same joy and happiness I felt while knitting them. Since 2011 Jewel and Rich have fashioned drapery and upholstery remnants headed for the trash bins into attractive bags and totes headed toward meaningful, repurposed existence. Celebrate the minimizing of the world's waste by choosing to appreciate and be inspired by a new sense of fashion. Solid cast glass with a "sandy" texture on the surface. Many color variations are available. Five inches in diameter. Jeff Thompson, a native Oregonian, has been a professional glass artist for well over 10 years. The techniques he tends to employ are based in Italian tradition, with a strong sense of innovation and adaptation applied to those ancient methods. All of Jeff's kilns are computer-controlled to provide optimum annealing, and this ensures a piece of artwork that will last for ages. Fire & Light glass is hand crafted glassware, made in Arcata, CA. Seven of their nine colors contain over 90% recycled glass. Each piece is hand made, one at a time. In fact, it takes three days to complete the process from start to finish. A variety of plates, bowls, glasses, soap dishes, candle holders, and vases are on hand at the Second Street Gallery. Lowell's most recent series of paperweights are called "coral reef." These detailed little "aquariums" are created using individually sculptured sea life designs encased in clear crystal. He blends colored glass with thick cylindrical glass cane for the coral reef setting. With a special hand torch, he may add a starfish, seaweed, or tropical fish, making each paperweight different from the next. Glass Sphere Ornaments and Stands Glass disks Stephen Kitras began working as a glass blower in 1988. He studied at Sheridan College located in Oakville, Ontario Canada. For five years he worked alone handling all of the production and administrative tasks. He and his wife Elke were shipping the product from their dinning room table. In 1994 Kitras Art Glass was formed and Stephen and Elke became founding partners of the corporation. At this time, the single most important factor in the company's growth was the beginning of exportation to the United States. By 2001 company sales had increased and a new facility was built to accomodate the increased production demands. In 2006 Stephen and Elke's oldest daughter, Sophie, joined the company and is now the sales and marketing manager. Stephen continues to be involved in the company, overseeing all new product development,training of new staff, and when he has time, working on his own art projects and commissions. In 1999, the company suffered the loss of Elke Kitras to Leukemia, but the vision that she and Stephen developed for the company continues to thrive. It is the vision of Kitras Art Glass to be recoginized as an excellent Canadian glass blowing studio that produces innovative, beautiful and decorative glass objects. We strive to create designs that enhance the modern home, garden and lifestyle. We believe that beautiful things enhance the enjoyment of everyday life. When surrounded by beauty the spirit is uplifted. We hope that you will be inspired by our products, our vision and our passion and share our message with your customers or in your own home. Glass Mosaics Karen Neal . . . . art education teacher who did NOT like teaching art! Loved DOING art! So, in the meantime, she taught Spanish (and loved it!) and upon retirement, got back to DOING ART! Mosaics started in 2005 when she mosaicked a 24 square foot wall behind her bar. The rest is history. It was too much fun to ever give up! She has done numerous kitchen back splashes, many trivets and mirrors, a multitude of dog portraits and plenty of landscapes. Challenges (i.e. a slaughterhouse side of beef) are so fun! She is passionate for color . . . and angles. When she's not mosaic-ing, she's hiking, drinking, cooking or eating. Glass Vases (Freestanding and Wall Hanging) Oil Lamps Mark Hines was born and raised in Southern California. Although Mark is basically a self-taught artist, early in his career he studied Glass Design and Ceramics at USC. In 1976 he began working with stained glass. From there he progressed to ceramics and in particular Raku vases which enjoyed great success. Mark currently produces a large and varied line of modern slump glass pieces making use of knowledge he gained while working with stained glass and ceramics. Sand molds give the glass an organic look and iron stands make the pieces very functional. His clients, many of whom are interior decorators, began requesting oversize pieces and Mark has been able to accommodate their requests with large glass vases, bowls, chargers and candlestick holders. Mark's designs have been shown in Architectural Digest and his pieces are in collections worldwide. Mark and Jeanne Hines and their son Eric reside in Prescott, Arizona. "Pieces in Time" The inspiration for "Pieces in Time" dates from when Alex was eight years old, and found a shard of Roman pottery on his father's farm in Bavaria, where the Romans had built a wall to keep out their enemies. A year later, after the fields were plowed, he found a 2,000 year-old Roman trail bead. He has been collecting ancient ornaments, coins, and beads, ever since. Her pieces feature hand forged bronze, brass, steel, copper, sterling silver and may incorporate gemstones, found objects, stamps, coins, nuts, bolts, charms, or talismans. Also known for her signature "Chunky Charm" and toggle necklaces. Jewelry is made by hand in their studio with real butterfly wings and sterling silver. No butterflies are harmed. They come from tropical butterfly farms within the rainforest and are gathered only after dying naturally. It is a rainforest "sustainable use" activity that helps preserve wild butterfly populations; provides needed income for the farmers; and helps save rainforests by giving them economic viability without being cut down. "Glass Roots" Inspired by tiny treasured bits of glass found while walking along the beach in beautiful Bandon-by-the-Sea, the jewelry made is created with both recycled and genuine beach glass. Tumbled smooth to the touch, each piece has inherent qualities that make it unique. Heather also incorporates historical glass from the 1936 Bandon fire in some of her pieces as well. Niobium is Holly's signature metal of choice. It is more precious than silver, rarer than gold, light as a feather, and 100% hypoallergenic. This magical metal will never tarnish and with proper love and care, its vibrant hues will never fade. Unique double pendants include a decorative overlay topping another piece with an engraved quote. Each piece is created using sterling silver and embodies an essence of her quirkiness and unfaltering cheerful spirit. Keith draws inspiration from the raw beauty of the Scottish and Irish landscapes. Each of his jewelry collections offers something unique that he has seen in a hidden mountain loch, the grey sky over the glen or the ripples on a sandy beach. Inspiration becomes design. His jewelry is fashioned from sterling silver, 10K gold, 14K gold or sterling silver set with solid gold 10K or 18K gold pieces. Cloisonné is the enameling technique Lisa uses most, the term coming from the French word "cloison," meaning an enclosed area or cell. She bends 24k gold, or fine silver with clear glass and fired in a kiln. Once cool, ground glass in a variety of colors is added to the piece and then re- fired at 1450 degrees for two minutes. Layer upon layers of glass are added with as many as 20+ firings. Lisa likes to create pieces that follow the natural lines of the body. Copper Bracelets Sergio Lub is a California jeweler born in 1953. He is also an architect, an inventor, speaks 6 languages, has been in 80 countries learning his craft and the traditions of wearing metals for beauty and wellbeing. A world renowned collection of nature jewelry. Using the lost wax casting method the designs capture all the beauty and exquisite detail of nature in metals, pearls, and stones. Alison Wahl, designer, uses Drusy, Sea Glass, Shells, Gem Stones to create images of beauty. The name Stellar Jewels was chosen for Alison's awe of the celestial sky. Stellar also refers to "the best" and that is what she strives for in her jewelry line. By designing and fashioning his own textures as well as individually hand- hammering and hand-sawing each piece of metal, Peterman creates simple yet elegant jewelry. His interest and enthusiasm for experimenting with rhythmic lines and inventive patterns results in unique and distinctive creations. Made in Canada. Like most Canadians, Tense loves to be in touch with nature and live a simple and casual life. They pride themselves in producing the world's most unique time-pieces that are loved by nature lovers around the world. Tense wooden watches are feather-light weight and smooth to the touch which makes them exceptionally comfortable on your wrist. Produced using sustainable methods. Remember the thrill when you found that unbelievably smooth piece of sea glass or pebble on the beach? Seaglass is proud to offer a beautiful and unique selection created in their studio from art glass, antique and recycled glassware. At Zealandia Designs they go to the ends of the earth to create unique jewelry. They hope you will appreciate the quality of workmanship that goes into the crafting of their original art jewelry as creation of their designs is a complicated process. The ancient fossilized walrus ivory they use is excavated by native Yupik from St. Lawrence Island in the Bering Straits of Alaska. In order to comply with CITES, the international treaty that protects living walrus, our handpicked materials is inspected by US Fish and Wildlife. Ancient ivory is a finite product and is becoming increasingly rare making it an excellent investment. Ancient ivory colors range from cream to black making each piece a one-of-a-kind work of art. KC Scott produced his fathers (Ken Scott Inc) metal sculpture designs since he was 18 years old. He developed and helped to discover many trade secrets over the years. Once he was completely on his own in the field, his past self education and his desire to create even more refined artwork took center stage. He has a great love for the medium and never stops inventing, creating, and refining his talents. It's evident in each piece he produces. Each sculpture is unique in itself. They are crafted individually by hand, using no laser cutters or mass productions. He makes his sculptures from the cleanest steel available, worked in a warm environment and sealed with a clear lacquer finish. Serigraph Prints (Silkscreen) As a painter and printmaker, Kathy's work is the visual language in which she sees the world. She finds our natural surroundings to be an inescapable positive link, a constant throughout our lives. She gravitates to patterns and color relationships in nature, and her compositions initially unfold based on those elements. Her paintings and serigraphs are more symbolic than literal, and are meant to evoke an emotional response. Her goal is to create something contemplative, reflective, and celebratory. Something as simply beautiful as the world she sees around her. From Port Orford, Oregon. After catching fish, Mari uses the actual fish skin and scales to make her prints. Unique and organic, her technique captures the meticulous detail of each individual fish. From Coos Bay, Oregon. Mitch uses the dry-point etching technique to make his prints. Prints in a variety of sizes display punctual detail and usually incorporate fish within the composition. Soapstone Sculpture Cave Junction, Oregon Gene's life followed a twisting trail that led him to many places and occupations, but the most important part is that Gene wound up in Alaska and he was introduced to Alaskan art. After being encouraged by friends to market the art work that he still did as a hobby, the artist soon found a demand for his work that led him to pursue a career as a full time artist. Asked to describe his art and lifestyle he responded, "My art is a reflection of my concept of my living experience. In each sculpture that I create I try to impart a mood or feeling that can be recognized by other people. When I create something that I know is good it pleases me because I know that it will please others as well." Historically, soapstone has figured prominently in early native American arts and crafts and because of its enduring beauty, it is still widely used today. Much softer than ivory and jade, it lends itself to beautiful renditions of wildlife commonly seen in America. From Anchorage, Alaska, Rob comes down to the Bandon beaches to capture fleeting moments. He also prints his photographs on a variety of surfaces such as aluminum and wood. Lincoln is a psychologist and a photographer who has been printing photographs for over 15 years. Much of his work is with infrared photography. He has won many awards and has been represented in Fine Art Galleries in Ohio, Kentucky, Colorado, Arizona, Utah, California, and Oregon. He is a father of four with five grandchildren. "Landscape never bores me and when it is grand I am called beyond myself, which is a good thing. For me a good landscape rendering evokes at once a sense of familiarity and a mystery, the recognition of a place I've never been and never left." The Process: Most of my prints are composite images. That is, they are made up of multiple digital frames stitched together in a computer. This image is then printed on photo paper, canvas or infused into metal. Only archival quality materials are used. Patricia Davidson is a Pacific Northwest outdoor photographer specializing in landscape, commercial/editorial assignments and travel photography. Currently, she lives on the beautiful Southern Oregon Coast. With a background in the visual arts and web development, she sets out to produce images that express her artist vision and passion for photography as well as her love of nature and the outdoors. A variety of prints available, also images on canvas and aluminum. Randall J Hodges has been capturing images of the Western United States as a full time professional photographer for over 15 years. Most of his work comes from time spent hiking and backpacking the wilderness areas of the west where he has hiked and photographed over 22,000 trail miles. Randall tries to share his spiritual connection with nature through his photography, "Take only pictures, Leave only footprints." A fourth generation Oregonian, Kelsay studied art at Lewis and Clark College and the University of Oregon. He spent 30 years in the Springfield School District as an art teacher and counselor. He now does graphic design and digital photography from home, in Springfield and Bandon. Wood Sabold, a former landscape architect from Florida, and his wife Jackie relocated to Bandon, Oregon in the summer of 1992 for Wood to pursue a full-time professional career in photography. An internationally published and award winning photographer with over 25 years of experience, Wood focuses on the outdoor scenic and nature photography. The unusual colors of dawn and twilight light and the saturated colors of overcast and rainy days give a special color dimension to Wood's work. Alder cylinders, napkin rings, candle holders, and lidded cylinders. Each piece of Alder is selected by hand and dried. Jim looks for interesting shapes and patterns in the pieces he gathers from the coastal forests near his home. Some even bear the markings of bull elk or deer that have rubbed the velvet off their antlers. In addition, Jim uses mortise and tenon joints and dowelled construction to ensure that his handcrafted furniture is not only beautiful, but is structurally sound and will last for generations. Jim's work brings the natural environment out of the woods and into the home without further degrading our forests or using precious resources. Original Myrtlewood Clocks "I have no regrets, but I had no idea what I was in for the day I inspired to design and produce wooden clockworks. My skill as a woodworker certainly helped, but it took years of work and study. It also took an investment in precision metal working machinery that I adapted to cut wood. The movements (gear work) are the same in all my clocks and to occupy the body of the clock, they share the same mechanical needs in terms of spacial dimensions and strength of support. From the moment of conception, when the fixed geometry of the movement engages the very fluid concept of form, my role changes from creator to parent. Like a gardener who plants a sunflower seed, he doesn't know what form it will take, other than it being a sunflower. He can only provide it with the conditions it needs to mature to its greatest potential and then watch what unfolds. I funnel inspiration from many sides of my life, but more often than not, I find that my clocks are born out of the humorous side." Miniature Wooden Boxes for holding the world's small treasures since 1978. Each box is made by hand and from the heart. The craftman's mark that signifies his care and love of woodworking is the little heart that you see on every Secret Box. Heartwood Creations not only love making little boxes, but they also love the environment. For every tree they use, they plant five in its place. Fine crafted functional and decorative furniture. Ed Nazemi aspired since he was a young man of using his artistic talent to work with wood. The opportunity finally came about when he retired and moved to the Bay Area to Humboldt County. Ed now works with exotic woods from all over the world and will as many as four different kinds to bring them together and create his unique furniture designs. Ed also offers custom furniture designs with a variety of woods and styles to choose from. Please email the Second Street Gallery and bandonartworks@gmail.com for further inquiry. Functional works of art. Enjoy the natural beauty of one of our finely crafted wood bookmarks, handmade in America from sustainable woods. Each bookmark is one-of-a-kind due to the varying characteristics of wood, combined with the artistic talent of their crew. Original handcrafted bird sculptures containing multiple types of wood with a satin lacquer finish and coat of paste wax to ensure the finish for years. Each piece is original; no two will ever look alike. Larry's interest in woodcarving began in 1982. After attending several seminars, taught by world class carvers, and countless hours of trial and error, Larry has developed a style he likes to describe as "stylized realism." He enjoys carving a variety of wildlife. Of special interest, the drama and fierceness of raptors. Extensive wood sculptures varying from functional cutting/serving boards, to furniture, and realistic and abstract decorative designs as well. Pete Bauer and Candace Kreitlow, a husband and wife team, began creating collaborative sculptures in driftwood in the early 1990's. While Candace has an extensive background in fiber, she has always maintained an interest in the medium of wood. As a former Air Force pilot and a thirty year veteran of teaching and coaching gymnastics, Pete is a student of things that "move." While his work utilized wood indigenous to Wisconsin, a chance meeting with Oregon coast carver Steve Kuntz introduced Pete to the challenge and joy of driftwood carving. Under Steve's influence and encouragement, Pete began working in the root systems of Redwood, Red Cedar, White Cedar, and Myrtlewood. Pete and Candace met in 1991 and almost immediately discovered their shared interest in wood art. Their subject matter is often abstract birds and fish, as well as more realistic representations of seals or dolphins. Candace is instrumental to the design of each piece and enjoys the detail work of the eyes and head. Pete enjoys the rough out process and much of the sanding and finishing. Original surfboard designs. Steve has lived in Oregon for 28 years and is currently working for the Oregon State Parks as a Team Leader in Bend, Oregon. Wood working has always been a hobby for Steve. He started shaping miniature surfboards just for fun a few years ago and then was convinced by friends to begin displaying in galleries. Most of the boards are made of South American hardwoods. Purple heart and Satinwood are his favorites because of their tight grain and color. They are very dense woods and provide some weight you can feel when you pick up the board. Other woods he uses are Myrtle, Hickory, Jatoba, and Mahogany. With the three different shapes and the various woods, the number of combinations is almost endless. Each board is built as accurate as possible with attention to detail. They are also built strong to withstand frequent handling. Terry J. Woodall specializes in myrtlewood sculptures of northwest oceanic and woodland wildlife. Using only the finest quality myrtlewood, he looks for patterns and coloring which are appropriate to each piece. Intriguing driftwood bases are combined with realistic animal carvings, enhancing the overall effect of the lacquer finished pieces. A third generation Oregonian, Woodall traces his heritage of the Oregon woods to his great grandfather who cut trees with a crosscut saw in the early logging days. Today, Terry salvages his own raw materials while maintaining a deep appreciation of his native woods, coastline, and the wildlife living there. From his studio-workshop near the coast, Terry enjoys observing gray whales, seals and sea lions, spawning salmon and the occasional Orca whale. Dock 6 Pottery Kerry Brooks has been a potter since 1988. She learned to throw in Ann Arbor, MI and has been working as full-time studio potter in Minneapolis, MN since 1997. She works primarily in wheel-thrown, high-fired stoneware. Her pots are fired to about 2400 degrees in a natural gas kiln so pieces without fused glass can be used in the oven, microwave, and dishwasher. Pots with fused glass are primarily decorative but can be used with dry foods and should be hand-washed. All of Kerry's pots are durable and they will not lose their vibrant colors over time. She hopes you enjoy her pottery for both its function and its art. Ikebana - The Japanese way to display flowers. Georgetown Pottery's Ikebana Vases combine the timeless simplicity of classic oriental porcelain with functional features making it the perfect gift. The permanently affixed pin frog secures your arrangement while its prongs pierce the flower stems - increasing water flow and extending the life of your blooms for up to three weeks. Ikebanas are not a traditional vase - anyone can create a beautiful arrangement that is ... Simple. Graceful. Elegant. Pit-Fired Pottery Originally from New York and educated in pottery at Penland School of Crafts in North Carolina, she moved to rural Oregon in 1983. The natural beauty of the area has a direct influence on her creative inspiration. She is fascinated by the many colors and textures she finds in the area and tries to reflect that in her work. After forming the pots they are fired at a low temperature in an electric kiln to increase their durability. They are then wrapped with locally gathered seaweeds, grasses, and ferns, placed in a pit in the ground, and covered with about two feet of sawdust. The sawdust is lit at the top and slowly smolders down around the pots for the next ten to fourteen hours. Color changes take place as the natural materials around the pots carbonize and are absorbed by the porous clay. Marty Schwartz has been a studio potter since 1975, working on the North Bay region of Humboldt County, California. "My work, handthrown in both porcelain and stoneware, is a reflection of my desire for simplicity, beauty, and functionality. Each piece can be displayed prominently in any home and used everyday." "Clay by Ray" Ray produces his functional and decorative stoneware pieces at his rural studio in Jacksonville, Oregon. The results are very durable, light-weight, completely lead-free pottery. His glazed wares are microwave safe, and oven-proof. Ray has displayed his work in galleries for over fifteen years. Nawal Motawi is the founder and principal designer of Motawi Tileworks. With her team of designers and craftsmen, she creates handmade, historically informed art tile for installations and as art pieces. Mr. Turner is one of the few people in the United States who produce raku fired ware year-round. He personally pulls each piece from the kiln and inspects each raku piece before it is signed and dated. The copper matte glaze used is one that he formulated and worked with for many years. The finishes are all derived around this one raku glaze and a combination of special techniques. He achieves a wide range of colors and has perfected both light and dark raku finishes. William uses as many unique shapes in his line that are the canvas for his raku art, painted with fire. Guisti's Enterprising Art Tom and Nancy formed Giusti's Enterprising Art in 1984- In the beginning Tom made Gyotaku and Nancy made large raku pottery. Over the years raku pottery has dominated the business and now Tom and Nancy work as a team, with Nancy's ability to draw and Tom's unique ability to create new shapes for Nancy's wildlife creations, they have created some bright, stunning and refined images to be used on the usually rough and primitive raku pottery. They find continuity in the control of the forms with Nancy's drawings and the spontaneity of the glazes reactions in the raku fire. Horsehair Saggar Pieces are thrown on a potters wheel and a terra sigillata slip is applied when bone dry. The piece is hand buffed for a smooth surface. It is bisque fired to cone 06. (Approximately 1800 degrees) Ferric chloride is then brushed on and the piece is wrapped in aluminum foil and placed in an outdoor kiln. When 1500 degrees is reached and the foil becomes brittle, the piece is lifted from the kiln with tongs, the foil removed, and actual horse hair is placed on the pot where it sizzles and burns and leave a carbon record of its little dance. The artist has about one minute to place the hair before the pot cools and the hair will no longer burn. The piece is then scrubbed to remove the hair residue and a sealer is applied. Candle Holders Mike is a craftsman and Pam in an artist and together have been making pottery since 1977. Oil Paintings Dan Dunn is a painter who paints his environment as he sees and feels it. Working from his personal vision, he joins a long line of artists who, in doing their work, have left us with a clearer and more intimate vision of the world. We enjoy in Dan's work his rare ability to make a significant statement using a marine format. His technique embodies all the spontaneity and confidence of a painter who knows his subject intimately. Watercolorist A fifth generation Oregonian on both sides of her family, Jane's work shows her love and relationship with the beauty of Oregon. Jane is an award winning member of the Watercolor Society of Oregon. "Watercolors...the free flowing, accidental, spontaneous medium has been my choice and challenge for 30 years. My love of the outdoors with its ever-changing moods and faces has been my constant inspiration. I am deeply interested in the possibilities for enigma with watercolors...undefined areas, soft or lost edges, bringing the focus into only some areas. I feel painting with unanswered questions leaves more openings for movement, personal interpretation, and emotional undercurrents. I often work in a series. Trees, nests and northwest landforms have been subjects I have explored. Patterns in nature and their abstract representation stimulate many of my paintings." Collagist Susan's paintings are often a combination of watercolor and collage, the subjects locally inspired landscapes, as well as still life. Using a variety of rice paper, and Chinese newspaper, Susan adds texture and images before she begins painting. On a few, Susan has "poured" her paints through rice paper and tissue, letting the paint dry, then removing the paper to leave the texture behind. Watercolor pastels and crayons have been used to further enhance the batik-like quality. 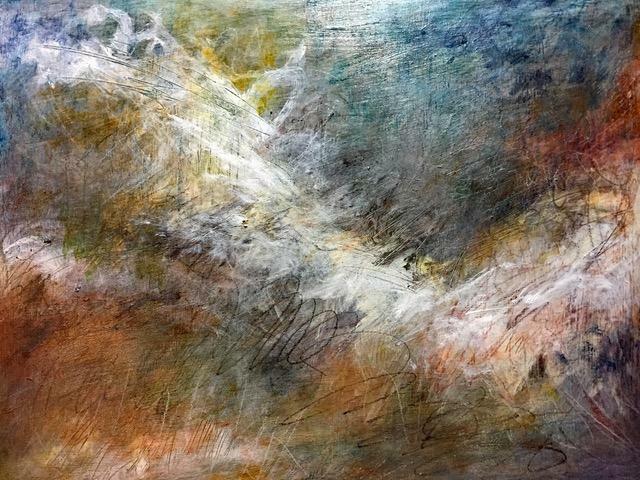 In her latest paintings, Susan has been experimenting with a variety of water media including fluid acrylics, gesso painting, and gel image transfers. Because of her textile background, subtle textures and colors appeal to her sense of beauty. She builds layers of paper and paint by using collage and glazes, usually finishing with fine line calligraphy over the surface. Oil Paintings "I find creative inspiration in the beautiful beaches of Bandon, and the comfort and power of the sea. My art is not only a representation of my subject, but also a reflection of my emotional response to that which I seek to portray." Watercolorist A variety of bird paintings and some including a unique interwoven design. Denise is a member of the Northwest Watercolor Society, Southwest Watercolor Society, National Watercolor Society, and Watercolor West. Oil Painter Before retiring from the United States Coast Guard in 1977, Don made his living saving lives in the most difficult and dangerous conditions that the Pacific Ocean has to offer. As officer in charge of search and rescue stations along the Oregon Coast, where unpredictable weather often creates some of the roughest seas in the world, he developed a great respect and admiration of the sea. When McMichael retired, he had growing concerns about the pollution of the oceans and the plight of the whales. "When I was young, the oceans were clean and abundant with life. Today our sea life has decreased and our oceans are endangered." McMichael's goal is to communicate through his underwater world of marine wildlife, a compassionate concern for the sea and man's interaction among the earth's precious marine mammals. Don spent many years perfecting his art. He is able to achieve such detailed realism in his work by researching and viewing his subject in the ocean's depths. When he dives into the ocean, it is to be among the gray whales in California and Oregon or with the humpbacks during the winter months in Hawaii. What he sees there swims to life on canvas in his studio that overlooks the waters of Coos Bay Oregon. Don has exhibited his art throughout the United States and has received awards from such notable exhibitions as the Audubon Society and Mystic Seaport during their annual international showsThe International Whaling Commission accepted one of his limited edition prints "Whaling Moratorium" in commemoration of the ban on commercial whaling. The White House purchased his Oregon Coast Music Festival Poster "Boogie at Seal Rock" after it appeared on the national television on the "Today" show. he is also an artist member of the prestigious American Society of Marine Artists, artist member of the United States Coast Guard Artist's Group, avid supporter of the Cousteau Society Center for Whale Studies and numerous other marine conservation organizations. Watercolorist Watercolors by Dutch Mostert feature maritime and contemporary subjects along the beautiful Oregon Coast and beyond. Dutch resides in Coos Bay Oregon and works from both studio and location to create his extraordinary watercolors. Typically his paintings demand many hours of time at the easel as well as hours of research. Working boats of the Northwest Coast especially tugs and fishing vessels are his preferred subjects and Dutch is especially gifted in his ability to capture the character hidden in their fine details. Admirers of his paintings often comment that they find themselves irresistibly drawn to his work. Mr. Ousley was raised in Kansas City, Missouri where his natural talents were encouraged both through elementary school and high school with classes at the Kansas City Art Institute and employment at Hallmark Cards. After graduating high school he relocated to Arizona State University. His studies were placed on hold while serving the United States Navy. While in the US Navy he was fortunate to spend time Athens, Instanbul, Barcelona, Palma de Majorca, and Tunisia where he was both inspired and educated by the works of the Classic Masters. After retirement he returned to Arizona State University to complete two degrees, then chose to establish his studio in Langlois, Oregon. Major artistic influences in his life have been Chuck Close, Wayne Thiebaud, Fritz Scholder, and good friend and mentor Earl Linderman aka Doktor Thrill. Artistic elements from expressionism, fauvism, and impressionism have been incorporated into his works. He takes the creative process forces from these inspirations, breaking out of the established patterns to present art in a new light. He uses the color to stimulate and disturb the status quo. This is evident by one of his favorite quotes from Edgar Degas, "Art is really a battle." Ava's primary interest is in landscape painting, especially plein air (painting on- site outdoors). Oregon's south coast offers an unending supply of inspiration. Saying in paint what we see and feel around us is an artist's greatest challenge. Oils are her favorite medium. 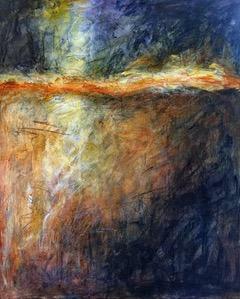 She also enjoys the challenge of working in pastel and other mediums, including mixed media collage. Ava works to support, encourage and broaden communication in the growing art communities of southwest Oregon. She co- ordinates artists, writers and venues to help create exhibitions, shows, and retreats, and occasionally teaches classes. In September 2006 she organized the Bandon Monday Plein Air Painters. All painters are welcome to join in and there is no fee. They meet outdoors Mondays- except when weather sends them indoors- to paint, sketch and share ideas. Most artists can recall the influences that led them to their passions. For Pat Snyder it was watching his father communicate visually while earning a living as a commercial sign painter. Pate took his innate talent to Northern Illinois University where he earned his Master of Arts degree. He works in acrylics, collage, and printmaking exploring the essence of the Oregon South Coast, where he has lived for more than 40 years. He strives to touch the viewer with the organic energy and beauty of the area by interpreting nature's surfaces, light and depth. Sometimes the viewer is treated to a view of the undergrowth, and the rusting and weathering of artificial suffices. All are part of the Oregon landscape. He is well recognized and respected for his art and as the former art teacher at Marshfield High School in Coos Bay. His teaching career began in 1967 and included college-level instruction at Southwest Oregon Community College. No doubt, he lit the fire under a new generation of artists. He retired from the classroom in 2998 and has been a working artist and museum volunteer since. Steele uses numerous layers of paint on canvas and wood panels, often enhanced by a high varnish finish. Much of her work evokes a richness reminiscent of an 'old world' era. "I try to incorporate a luminous inner glow in each painting," Steele states. "I want my work to appeal to the viewer's emotions and memories...leaving some of the painting unexplained, just as life is." Steele now resides in Gold Beach, Oregon with her artist husband, and continues to travel throughout the American West, painting and gathering further inspiration. "My style is what I call, Expressionistic Impressionism. I delight in shape and color, using lots of thick, 'fat' paint to create a rich texture and depth. While working I strive to paint spontaneously and with as much feeling and energy as possible, hoping that in the end, some of this good, positive emotion is somehow passed onto the viewer. I live in Gold Beach now with my wife and best friend JM Steele." JM Steele and Tod Steele are both professional artists who have teamed up to create a new collaborative style of paintings. The images are bold and colorful and the subject matters of iconic animals in acrylic on canvas. The fun and unique part is that they paint on the canvas at the same time, and to enhance the process they use their hands to paint with (only using brushes and texturing tools for finishing touches). The outcome for this husband and wife team is an exciting contemporary style that captures the spirit of both artists, and converts their love of animals. Watercolorist Victoria lives and works in Bandon, where she has made her home since 1977. Her watercolors, colored pencil murals, photography, set designs and pebble mosaics are well known on Oregon's South Coast, and she has exhibited throughout the state, through the Portland Art Museum, the Coos Art Museum, and the Watercolor Society of Oregon. 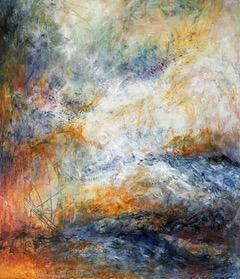 She has had many solo shows over the years, and her work is in many solo shows over the years, and her work is in many collections across the country. She works in both abstract and representational styles, and loves to travel, sketching and painting as she goes. Victoria studied Fine Arts at the University of California, Berkeley, and worked as an art director and illustrator in San Francisco, New Haven, New York, and Los Angeles, where she worked with Judy Chicago at the California Institute of the Arts (Womanhouse Project) and was a West Coast Correspondent for the New York Village Voice. She has illustrated several children's books. She is also an art advocate as well and has curated many art shows, for the Coos Art Museum, Harbortown Events Center, the Bandon Boarkwalk, Evergreen Court in Coos Bay, and the Southern Coos Hospital & Health Center in Bandon, for whom she has curated four shows a year since the year 2000. Oil Painter David's work has been displayed at the Second Street Gallery for many years. His colorful work matches his optimistic personality. Once you begin to view his paintings, you will easily recognize his unique style of incorporating patterns and vivid coloration. David's work varies in size, including prominently proportioned works and he is also known for his prismatic fish which have been displayed around Coos County. Watercolor on Yupo Local artist Patricia Cink paints beautiful seascapes, landscapes, and trees on Yupo paper. Yupo is a synthetic paper which is actually waterproof bestowing new challenges to the basic techniques to watercolor painting. Patricia has participated in the Second Street Gallery's Meet & Greets in the summertime demonstrating the challenges and positivities to painting on Yupo. "My art is a struggle for tranquility. Tranquility is reached when everything comes together in a pleasing relationship, but the interesting evidence of the struggle can still be seen in the layers of color. I use watercolor on Yupo paper and soft pastels to immerse myself in the color of the landscape, letting the composition follow. Both media allow for continual modifications as the painting develops." Watercolorist Magill paints a variety of subject matter, but all invoking the aesthetics of local terrain, animals, and daily life. Watercolorist Clyde paints beautiful images of the local terrain focusing on maritime. Clyde is also an active member in the community volunteering to help teach art at local schools and also abroad. Watercolorist From the local cypress trees to beautiful seascapes and maritime paintings, Hyon's work is bound to evoke emotion and place the viewer within memories of the beautiful Oregon coastline. Oil Painter William's paintings are a spectacular addition to the Second Street Gallery. His images of the Bandon Beach make you feel as though you are right there in the moment on a sunny day in Bandon. His maritime works also demonstrate his excellent ability to capture light and reflections. "Copper has an innate warmth, like a wood burning fireplace with family surrounding. Our copper expressions will make you feel that warmth." Jennah and Paul Yost's copper art partnership has brought them to the peaceful, rugged beauty of the Oregon mountains. Jennah's lifelong commitment to art has blossomed in copper and together, with the help of family, they began Firesmith Copper. Jennah's natural talent for creation jumps from her copper designs. With a mind for design and an eye for color, Jennah coaxes breathtaking images from the copper while also maintaining the material's organic beauty. Paul approaches his designs with a pragmatic influence, gently coaxing elegant images out of the copper. With his carpentry experience, Paul finishes the work by shaping the copper to the hand built frame. They both contribute to the creative process from start to finish. All their pieces are handcrafted, each with their own ideas, and each with their own styles merging into an expression they are both proud of. "At Firesmith Copper, it is our passion to create unique, handmade works of fine art. Firesmith Copper, to us, means; Art, born of fire...See what unique piece we can create for you!" Replicas of earth's precious stones, made from mild, extra long-lasting, vegetable glycerin soap. Like fresh air on different days, each variety has its own unique, light aroma. A unique blend of whole herb extracts, vitamins and minerals, from aquatic, botanical, and terrestrial sources, come together as a never before, in the gentle, biodegradable bases of SoapRocks. HOW WAS THE PRODUCT INSPIRED? How do you integrate an eclectic background in Conceptual Art, Geology, Cooking, Gardening, and a little Chemistry thrown in for good measure? SoapRocks, of course. It only took me 36 years and a shower one cold February morning with just soap scraps to use for washing. After a minute, I looked down at the object in my hand and saw a rock where pieces of soap used to be. There it began. Soap-Rock! SoapRocks! That light bulb moment and seven years of integrating herbs, oils, and wholesome ingredients changed the nature of bathing forever. Here Are A Few Of My Thoughts About SoapRocks. Soap reaches its consummation in SoapRocks® bath soaps. As a study in diminishing beauty, they bring wonder to daily life, transforming the most mundane of tasks into an inspiring daily reminder of nature's beauty. Unlike keepsakes, which are put up on a pedestal and soon forgotten, the beauty of each SoapRock is magnified in action! Under water, lighting up with brilliant natural color, their smooth stone-like texture will gently cleanse with a light lather, leaving your skin soft and refreshed. Discover the ever-changing contours of SoapRocks® bath soaps and let their beauty become you. One Question We Often Get Is This: As beautiful as they are, how could you ever use them? How could you not? Each SoapRock® soap bar lights up under water, and over many uses, slowly weathers away in your hands like a stream stone in geologic time. SoapRocks® soap bars are endowed with extracts of earth: Aloe, Calendula, Chamomile, Comfrey, Lavender, Vitamin E, Jojoba Oil, Olive Oil, Almond Oil. Thus you can experience a beauty that penetrates, yet is skin deep. Prepare yourself for a consummate washing experience. They are a hybrid dense glycerine soap that lifts very little oil off of the skin as they gently cleanse. They are the art that touches us intimately, teaching us to appreciate beauty by using it, and letting it go. What Becomes A Work Of Art? ..... You Do. A unique candle with a wooden wick that provides a smooth and soft crackling sound as it burns. Come find a challenge with our 1000 piece puzzles and that not as easy as it looks Scramble Squares. Ornate handcrafted bookmarks and watches. Kelp Baskets Made from kelp and seaweed....stormtossed...sundrenched...an d gathered from the windswept beaches of southern Oregon. Colored Pencil Artist Gay Holland is a Bandon artist whose work will make you stop in your tracks to analyze and decipher the medium used. A master of her trade, Holland's colored pencil drawings are always executed with precision. In the shadows of the Sangre de Cristo mountains sets a century-old adobe ranch house where artisans hardcraft art knives of rare beauty. From one-of-a-kind custom designs to popular, affordable collections of pocket knives, table and kitchen cutlery, men's gifts and accessories each Santa Fe Stoneworks collectible is a unique example of the cutler's art - the quintessential marriage of fine steels with gemstone, shell, or intricate marquetry. To wear the Santa Fe Stoneworks name, each piece has completed a journey of countless painstaking steps. An artistic journey we travel, some think, to perfection. Brooms and Walking Sticks Established in 1981 in the Ozark mountains, the business is now located in the Pacific Northwest. Scheumack is one of the oldest and most well known names in their craft. Their products are extremely durable as well as decorative. About our philosophy In a day when "globalization" means an easy profit for those that have no conscience against the cost ......... In a day when "planned obsolescence" is a calculated business strategy ....... In a day when the individual craftsman is a dying breed in a culture that seeks the latest thing, at the cheapest price, knowing that tomorrow it will be outdated ........ or broken .......... our small business has not compromised. Okay, it's a small thing. A broom. Some sticks, grass, and some woodcarvings. But "from simple things do great things grow." From the Buddhist teachings of "Mindfulness", and "Meaningful Work" we offer you our humble craft. Whether your need is simply the best and longest lasting broom you've ever had, a ritual piece for a sacred spot in your life, a ceremonial piece for your wedding or hand fasting, or a theatrical piece... this is the real thing. About the process Scheumack Brooms are made of only the highest quality 100% broomcorn and Southern kiln dried hardwoods. The tools used to make the brooms are actually still old tools from an 1878 broom shop in Kentucky ( The foundry marks can still be clearly seen on the castings). They are extremely functional as well as decorative. We do every aspect of the work , from harvesting and preparing the raw materials to the finished piece. From the little sapling that was harvested out of the Ozark Mountains to the finished tool you hold in your hands, we made it with love …… and sometimes weariness ….. or any of the plethora of things we humans travel through down life’s road. But WE do it all. Drawings on maple and other hardwoods, concentrating on equine, wildlife and Native American themes. Oil Painting "This is why I paint. Nature is venerable...Nature is timeless...and Nature, in whatever form, will be...long after the works of Man have gone." Third Wish Jewelry A line of jewelry that combines traditional jewelry casting process with the patinas process that were developed by Ian and his father Andy. Check out both Ian's patinaed bronze and sterling silver lines of pendants. Handcrafted titanium and Redwood rings, bracelets, cuff links, and barrel beads. Extremely light, comfortable, and waterproof, the jewelry is designed for daily wear and active lifestyles. "Salt Traffic" Alex Linke, creator of 'Salt Traffic' mobile, was born on a farm in Bavaria, Germany, near the end of World War II. When he was eight years old, he found a shard of pottery near the site of an old Roman wall in his father's field, a discovery that launched a life-long passion for collecting ancient ornaments, coins, beads, and artifacts. The 'Salt Traffic' mobile is a celebration of ocean life. Whales, sharks and dolphins swim and spin below the ocean's surface. On top are sailing and cruise ships; cargo and fishing vessels; tugboats; barges and an old steam-powered paddle wheeler. A Coast Guard helicopter surveys the sea below and a lighthouse stands ready to aid ships in distress. A lone submarine plumbs the ocean depths below. The mobile's structure consists of a bronze platform that serves as the ocean's surface. The finest-quality stained glass is used to shape the mobile's vessels and marine life. Small pieces of amber and fossil ivory are also employed. In a slight breeze, the mobile's perfectly balanced components will turn slowly. Three available sizes Small: 18" x 14" x 22" Medium: 25" x 16" x 24" Large: 30" x 22" x 28"
"Creating is a way of life. Whether its adding to my sketchbook, stretching some canvases, or welding together some metal into a dynamic sculpture, creating something from nothing is satisfying experience that I strive for every day." Steve Kuntz' intention with his work is simple -- to connect our modern sensibility with the deeper mysteries of being human. He selects his wood with longevity in mind to create sculptures that will continue to stir our sub-conscious with ancient, yet familiar images. Some of the wood he works with is hundreds of years old, fostering that important sense of connection between past and present. Finding herself with a new graphic design degree and a "dot com" job in Silicon Valley, Jade Chiu soon understood that ignoring her fashion design instincts wouldn't do. So she bought a one-way ticket to NYC and immersed herself into studying fashion and accessories at FIT and Parson's School of Design. Since then, New York based Taiwan-native, Chiu, has contributed to the studios of Anna Sui, L.A.M.B., DVF, and Baby Phat. She is self taught and combined all of her art/graphic/accessory and fashion background, to creating her new jewelry line. Succumbing to her long-held dream of creating accessories around Eastern zodiac animals, Jade launched the "Fusion Lovers" line in 2009. Skin, chain, and crystal combine in mini-sets of accessories that revolve around Jade's playful imaginings of the styles, muses, networks, status, and styles of her 12 zodiac dolls. In 2011, Jade delved deeper into zodiac identities with "Fused Babes." A pop surrealism jewelry line of stunningly imaginative fashion-art pieces, the jewelry personifies and animalizes expressions and features of the face. In 2012, she opened a show in Paris, with the launch of "Zodiac 12" collection, the eyes of world-renowned stylists, editors, and photographers are on her. Her pieces have been picked by Italian Vogue, i-D UK, and Shinsegae campaign and continues to set global trends. For more than 40 years, Don Barber built wooden boats in the small fishing and timber town of Coos Bay, Oregon. In 1979, Don retired from shipbuilding and started a family business handcrafting old- fashioned baskets out of rare Myrtlewood and copper. Many of the same tools and skills used in boat building are still in use at the basket shop today. We build the baskets...one at a time, by hand...fastened with copper nails, air dried, sanded and dipped in clear mineral oil to leave a stunning natural finish. We use Myrtlewood and solid copper. The final product is light in weight, very durable and will give its owner many years of service. "I am in love with clay. It has been a major part of my life for over 35 years. I am a traditional potter and each piece is individually made. My work has recently taken a new direction. I have stopped throwing on the potter's wheel and now concentrate totally on handbuilt pieces." One of her areas of designs has an Asian focus. She is fascinated by the simple but elegant style of oriental art and characters and incorporates this in her work. She tries to create a feeling of tranquility in her pottery. Michel attended San Jose State University and received her Master of Arts degree (with a ceramic concentration) in 1972. She taught ceramics, weaving, basket making, and other crafts in California community colleges for 10 years. Since moving to the northwest in 1982, she has been working and producing pottery in her own studio. Born in Kansas City in 1946, Dutch spent his childhood in Missouri. He received his degree from the University of Missouri after studying Art and Art History at Wagner College in Bregenz, Austria. Upon graduation he turned to sculpture, working in clay and woodcarving. By 1975 he was living on the south coast of Oregon and casting his sculptures in glass. He established his own glass studio and gallery in 1990, where he created large- scale blow-glass vessels as well as his cast sculpture. Now he works exclusively in kiln- casting, with a focus on figurative forms cast in crystal. Hand Designed Sea Grass Baskets Baskets woven from sea grass with embellishments all found along the seashore. Misti Martin a native New Yorker is the founder and creator of Misti Martin Designs and Mystical Madness Jewelry Collections. Since 1992, Misti's unique designs and ability to merge fashion trends with a medley of natural stones and minerals have provoked interest from people around the globe. "The inspiration for the jewelry comes from my fascination with the many natural resources that come from earth and sea. I consider jewelry making to be an art, but rather than using watercolors my palette contains a rainbow of colored gemstones and unusual agates. I draw from an endless ocean of materials. Turquoise, amber, aquamarine, opal, seashells, fossils, and petrified woods- to name just a few are among the many materials that are incorporated into my work." By combining these raw materials with intricate craftsmanship, metal smithing and current fashion trends, Mystical Madness offers collections that are infused with a fresh bold spirit that is both striking and distinctive. "I love the world of gemstones and have traveled the world to many exotic places collecting the lapidary treasures that dictate my jewelry. It is the stones themselves that guide me to my next collection." "As a young girl I was introduced to the mystical world of jewelry when I would visit the American Navajo Indian Reservations with my grand father, who was a purveyor of American Indian jewelry and artifacts. Curious that turquoise came in so many different shades of color- from deep mossy green to azure blue, and fascinated by gently pounded silver squash blossoms- I saw these jewelry pieces as art- being coveted and collected and cherished by those who found them. This is where my fascination with mystical symbols & jewelry first began. Hence years later my design vision and passion for exotic jewelry, travel to distant lands and the madness of the modern world gave birth to Mystical Madness Jewelry." Today Misti currently resides in Laguna Beach, California and the tropical island of Bali where she is busy creating the up coming collections. In between she continues to travel and explore, collecting new materials and inspiration from around the world. "The jewelry, the travel, the food, the many different cultures....it's such an experience- & it's all part of a great journey....I had a dream I would be a jewelry artist. I have dedicated many years to this vision and am proud to be living it! Enjoy!" Don and Scot met in Leaburg, Oregon while both were apprenticing under a well known Northwest metal sculptor. The friendship was forged. Don had a background in logging and Scot had worked in pipe bending and metal fabrication. After being laid off from their jobs they both found themselves working in this strange new environment and quickly realized their past working skills could be applied. After years of study they began to apply their new found passion and ideas in a joint effort of creating their own sculptures. With never ending imagination and vision, they are sure you will see new and exciting concepts and designs for years to come. Both men live in the Willamette Valley in Oregon where they find much inspiration from the beauty that surrounds them. They share a common passion for family and the outdoors as well as helping within the community. They find peace and purpose through their artwork. Whether at home, with their families, in the studio, or cruising the highways on their Harleys, they are always in the creative process. THE PROCESS: Scot and Don start by designing a piece on paper, then they take it to the metal.... Through processes of cutting, shaping, texturing, and flame painting the metals, they create the scene they envisioned in their minds. All the work is done by hand and the natural beauty that is pulled from the metals create these works of art. Sometimes acrylic paints or foils are used as accents. The results are unique wall sculptures that last for generations. "We hope you enjoy our work as much as we enjoy creating it for you. The beauty that can be pulled from the different metals is like nothing else. It makes all the burns and stitches worth it!" Kiln Formed Glass in Cottage Grove, OR Made for you by Shifting Sands Studio, her pieces are composed of transparent and opaque glass and may contain iridescent glass with dichroic accents. Pieces of art glass are cut by hand and arranged on top or next to one another before firing. The glass is then fused (or melted) together in a kiln at temperatures ranging from 1300 to 1500F. The end-product is a unique, new sheet of solid glass which has multiple dimensions, textures and shapes. The new sheet of glass is then taken to the grinder to smooth and shape edges. 18k liquid gold accents are used to sign on the back and add accents to the face in some cases. This sheet of solid glass in then shaped and placed back in the kiln and "slumped" into the final form by placing on a preshaped form and heated to about 1150F. Her items are quite sturdy, and should survive most household uses. To clean, wash gently with dish soap and water, do not wash in dishwasher. Do not use in the oven or microwave. Central Point, OR Watercolorist "Born and raised on a farm in Minnesota, I do not recall a time I did not enjoy drawing and "coloring!" At the age of six, I started school with a callus on my pencil holding finger. Mother died when I was 14 and being the youngest of four girls, it was off to boarding school for me, graduating from Oak Grove Lutheran High School in Fargo, North Dakota. I received my Bachelor of Science Degree from Concordia College in Moorhead, Minnesota. I taught secondary education until my husband Earl and I started our family in 1961. After exploring many media, I unleashed my true passion: transparent watercolor. I love the unpredictable results of mixing pigments on paper. The subject matter for me varies from my favorite florals, to lanscapes, old buildings, people and animals. They say "paint what you love;" I love contrasts of color, value, textures, and shapes. Minnesota is my native state, but I have thoroughly enjoyed living in the Rogue Valley since 1973. As a member of the Watercolor Society of Oregon, Western Federation of Watercolor Societies, and Montana Watercolor Society, I have been honored with award winning paintings in national juried shows and have exhibited in Minnesota, North Dakota, South Dakota, Montana, California, Nevada, Washington, New York, Pennsylvania, New Mexico, Louisiana, Missouri, Rhode Island, Colorado, and Texas. Bandon-By-The-Sea has been our favorite Oregon Coast town since 1974. It is where we have collected beautiful memories for our family, three generations!" Shawn Tempesta is a member of the Second Street Gallery staff and displays her collection of bullet shell jewelry mixed with Swarovski crystals, quartz, onyx, dichroic glass and other fine materials. She is also very skilled and knowledgeable in wrapping techniques and implements that process in her necklaces and earrings. Shawn moved to Bandon from Hawaii and has become a prominent figure in the community. As an advocate of the arts she volunteers her time to arrange local art exhibitions and plays a significant role in the co-op gallery, Art by the Sea, also in Old Town Bandon. Shawn is an outgoing individual that is educated and experienced in the realm of gemstones and is happy to answer questions pertaining to her love and your love of jewelry. Portland, OR I began my journey with metals at Evergreen State College working large scale with copper, brass, and steel, learning soldering, oxy-acetylene and MIG welding, forging, and a variety of cold forming techniques. I decided that I wanted to work small scale and, after working for a wire work jeweler for a time, that I didn’t like wire or beads. This lead me to North Seattle Community College where my passion for metals and stones was cemented in place and I began to develop my own style along with fine tuning my skills. I now take classes at Multnomah Arts Center and am a member of the Portland Creative Metal Arts Guild. I hand craft all of the pieces myself. Chains and some findings I get preformed to save time, but when you buy one of these pieces you can be confident that from the initial spark of an idea, to design, to fabrication your piece is one of a kind, specially made for you. Check out my Facebook to see the step by step details involved in my work! I believe that everything is alive. Maybe not conscious—but all things, animate and inanimate, give off vibrations so subtle we can only just sense them. People who give off complementary vibrations enjoy each others company, even if they are polar opposites. I think this is why we are attracted to certain shapes and colors more than others, and, when applied to my field of work, stones and metals. Have you ever seen the piece of jewelry that just calls to you? You know the one. The one sitting on a piece of velvet that you just have to touch, to wear. You can’t help but ask to handle it, whether it’s the price of a coffee or more than you have in your bank account. The jeweler will hand it over because they know the feeling, it’s why we do what we do. We know the desire to be close to something that resonates with our being. When two notes are played simultaneously the frequencies will actually resonate together and create a third note. We resonate with the things and people around us, our vibrations mixing to create something more than the sum of it’s parts. The symphony of the universe. And this is what I believe my calling is. To give you something beautiful that makes you happy every time you look at it and confident every time you wear it. Ceramic Sculptures I like playing with animal shapes, people, nature and mixing in flairs of the abstract to add to the realistic nature of my art. I distort shapes slightly and add a little bit of eccentricity to keep my art interesting, while still preserving the life-like nature of my pieces. Over the years, my two passions, traveling and art have grown intimately intertwined. My frequent travels have become the main inspiration for my work. The exotic places I visit rouse something inside me that translates into ideas for clay. Every time I travel in a new place and see new things, I get excited thinking of different ways I could depict these inspiring things in my own way. Traveling to Europe, Africa, China, South America, & Tibet each inspired their own unique beauty. Whether building a French worker, an African giraffe, a Tibetan monk, or a farmer from my homeland in China, I love to capture and portray their individual uniqueness and beauty. My hope is for you to enjoy the beauty of my passion as much as I enjoy making it. I want my art to speak to you, and to touch you on a deeper level than just the pleasing of your eyes. My intention is to create art that expresses my travels and my thoughts, and hopefully speaks to everyone who observes it. Wood Fired Ceramics Firing Methods and Results Wood Firing Relatively few working potters use wood as a fuel for making pottery. The process is demanding and requires a great deal of time. Intensive labor is needed for preparing wood, as well as, maintaining and firing the kiln. Some potters use wood for ecological reasons, however most choose wood firing because of the effects achieved from fly ash and flashing. Wood firing is not the easiest method for producing matching wares. It is best utilized by potters seeking unique & natural process driven surfaces, which result from firing with wood as a fuel. "I consider my work to be a "folk art" style. Although I have formal training in art, I strive to emulate the feeling of clay works by ancient and indigenous people of the world. My focus is contemporary. I give most of my works anthropomorphic qualities, or characteristics of humans. I am influenced by the people around me, and they become the subjects of my work. I appreciate that people smile, laugh, or even look perplexed when they see my work." Designs in the Light is a husband and wife, Michael and Cherrie Fick, collaborative jewelry design team. Their jewelry is produced in their home studio in the bay area of Northern California. Together Michael and Cherrie design high quality, hand-crafted artisan jewelry collections. They create many of our pieces to coordinate in color and texture for a layered and stacked look. Collections include: Urban Boho Chic, Beach, and Nature inspired jewelry. Hand-crafted Metal Clay and Gallery Collections. I've been an artist at heart all my life. Having an architect as a father while growing up in the metropolis of Warsaw, Poland, greatly impacted my creative pursuits. After studying architecture myself, I realized that drawing and painting were natural and enjoyable for me. Only in the last few years have I had enough time to dedicate my life to art. Being a first- generation immigrant, I had devoted my first years here to assimilating myself and my family into American life. Eleven years ago I finally began to paint professionally. Another dream of mine materialized soon afterwards, when I opened my own gallery. After living in California, Maine, and Minnesota, I have found Gold Beach, Oregon, to be very peaceful in comparison. The rugged coastal landscapes of the ocean, the mountains, and the deep forests are the inspirations for almost all my art. In my paintings I try to capture a specific moment in time through my perspective of the beauty of nature. Sometimes I use soft pastel colors and other times I use bright, almost unreal colors to achieve a very strong contrast between light and shadow. My goal is to portray on paper and canvas the wetness of the rain, the thickness of the fog, and the heat of a sunny day. I wish for my audience to be able to smell the fragrant ocean breeze and the wild meadow, but many of my works remain untitled for the reason that I do not want to dictate the mood or impose a specific response from the viewer. After looking at one of my paintings, one person may be left with a feeling of loneliness while another may feel hopeful. I wish to leave that private matter to the viewer. I have used numerous media including acrylics, oils, and pastels, but I keep coming back to transparent watercolor as my first choice. In my first career as a high school science teacher I tried to share the joy and excitement of exploration, experimentation, and discovery. After the lesson plans and paper work, on weekends and during vacations, I played in my studio as an artist. Stained glass lead to fusing and slumping, which lead to casting. During six summers at Pilchuck Glass School, I studied with Sidney Cash, Stanislav Libensky and Jaroslava Brychtova, Ulrica Hydman-Valien, Jose Chardiet, and Robin Grebe. In 1989 I was chosen as one of nine students for the first Libensky Masters class. The class was intense in technical aspects of glass casting and the "art" of sculpture. After retiring in 1998, my husband and I moved to Charleston. I continued to sculpt and cast in glass and bronze. I loved to paint with glass frits and prowders, fuse and slump smaller pieces. So naturally I took up oil painting. Then I wanted some prints of my paintings. I bought a large format giclee capable printer. Profiles, archival papers and canvas, inks, and color correction has involved a lot of new study. With printing "in house," I took up photography. Now my studies have broaden to cameras, lens, and lots more equipment for taking the perfect picture. I also enjoy post-processing of photographs and enhancement of the canvas prints. Artists ARE scientist too. We never stop experimenting and learning. Albert Einstein said it best: "The pursuit of truth and beauty is a sphere of activity in which we are permitted to remain children all our lives." Candace Kreitlow is both a visual artist and a musician. Candace earned a Masters of Fine Arts at the UW Madison studying textiles, costume and theatre lighting design. She went on to teach theatre and textile design at UW Madison, while creating a significant body of work which she exhibited nationally. Her works are seen in a variety of commercial buildings and residences. Candace has included music, a lifelong passion, into her professional pursuits. Her musical resume` includes ten CDs since 1992. Candace is also drawn to the medium of wood and creates sculpture with her husband Pete. “I’ve been easily lured into sculpting, and Pete and I often work together on pieces, but I avoid his chain saw like the plague!” she says, protectively of her musical and weaving fingers! Ava Richey is an oil painter who loves to use other mediums too. She finds the challenge of painting outdoors (plein air) affects all of her work. She hopes the pleasure she finds in art is passed on to others in the paintings she produces. She organizes a weekly plein air group, puts out a weekly art events newsletter, and is involved in producing show opportunities for artists. www.susanlehmanartist.com Susan has worked at Second Street Gallery since 2004, when she moved to the Oregon Coast with her husband. She teaches art classes for both adults and children, specializing in collage techniques. Her own acrylic collages can be seen on display at several west coast galleries, including Second Street Gallery. A former interior decorator, Susan can help you choose art confidently for your collection as well as help you coordinate with the style of your décor. 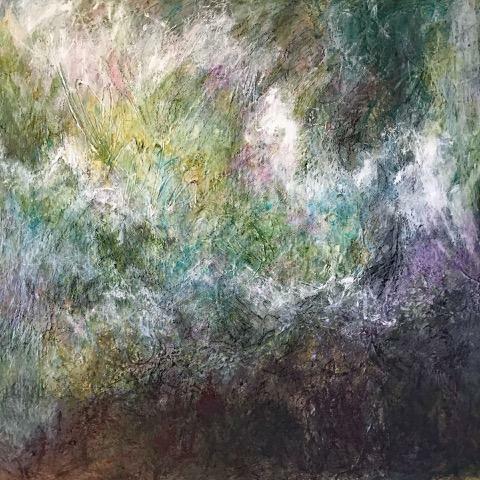 Susan’s knowledge of art, gained from her formal art training at California College of Art, is an asset she shares with customers who are interested in purchasing art at Second Street Gallery. Shawn adds a boost of positive energy to the Second Street Gallery, always wearing a smile and enjoying the surroundings of people's creativity. She is an excellent resource in the realm of jewelry, having been a jeweler herself for several years. She is happy to assist in any way possible and is also informative about other local artistic events and groups. Steven is new to the Gallery. He is a woodworker. Laurie is an oil painter although it has been some time since she had broken out her paints. She is new to the gallery this year. Laurie also participates in the Sawdust Theater had has been a member of the cast for the last 8 years.